In yesterday’s newsletter, we discussed how crude prices were struggling to stay above $50/bbl – and just in time, since crude closed at $49.98 last night. Prices have since risen back above the $50 level, with a gain of 51 cents this morning, though we’ll have to see whether the price holds. 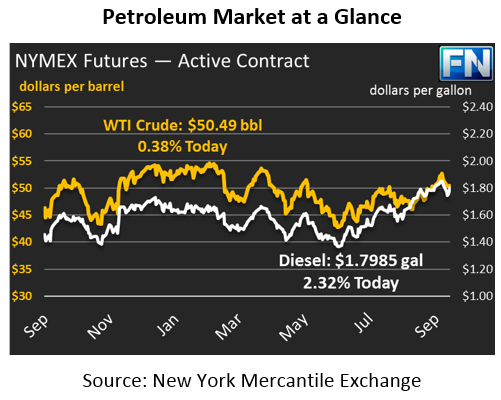 In contrast to crude’s weakness, refined products both saw prices swell higher. Diesel prices gained 2.8 cents yesterday, propelled by strong stock draws. Prices are up once again this morning, with prices at $1.7985 currently, compared to yesterday’s opening price of $1.7460. Prices are once again dancing near the $1.80 level, where they remained for weeks in September. Gasoline prices are leading the complex higher, with gasoline gaining over 3 cents yesterday and up another 3 cents today. After falling from $1.74 to $1.54 in just a week (an 11% correction), prices are on the upswing, with prices this morning at $1.6114, a gain of 3.09 cents (2%) since yesterday’s closing price. The EIA’s report should have helped support crude prices – a 6 million barrel (MMbbls) draw is not unsubstantial, and was larger than both the market expectation and the API report. However, given the supply disruption of crude shipments during Hurricane Maria, imports were unusually low, while exports set new record highs. Given the large spread between WTI (U.S.) crude oil and Brent (international) crude, markets have been expecting exports to help narrow the spread, so those exports were mostly priced into the market already. Still, it’s a bit surprising that such a large build did not create any upward impact on the market. Gasoline and diesel stocks traded opposite each other – gasoline saw a stock build as demand tapers down, while diesel stocks fell amid strong fall demand. Despite stocks moving in different directions, prices both rose yesterday, indicating that markets still are not too concerned with inventory reports following the hurricanes. Yesterday, we sent out a storm alert about Tropical Depression 16, now Tropical Storm Nate. The storm system is expected to travel towards the Gulf Coast of the U.S, making landfall Sunday as a tropical storm or a low-grade hurricane. Of course, much could change in the coming days depending on the path and speed of the storm. We’ll continue reporting on it as it strengthens and approaches the U.S.